Deep Magma Can't Rise but Sinks: The Crossover Depth! * Magma Below the "Crossover Depth" Can't Rise: Real Science Radio hosts Bob Enyart and Fred Williams chat with aerospace/defense industry mechanical engineer Bryan Nickel on the physics of deep magma plumes. Why? Why in the world would anyone care about deep magma plumes? Well, because if the laws of physics can be trusted (which they can), then deep magma (below 220 miles) can sink, but it cannot rise. That means that the theory of plate tectonics is false, and so is any creation model based on plate tectonics. 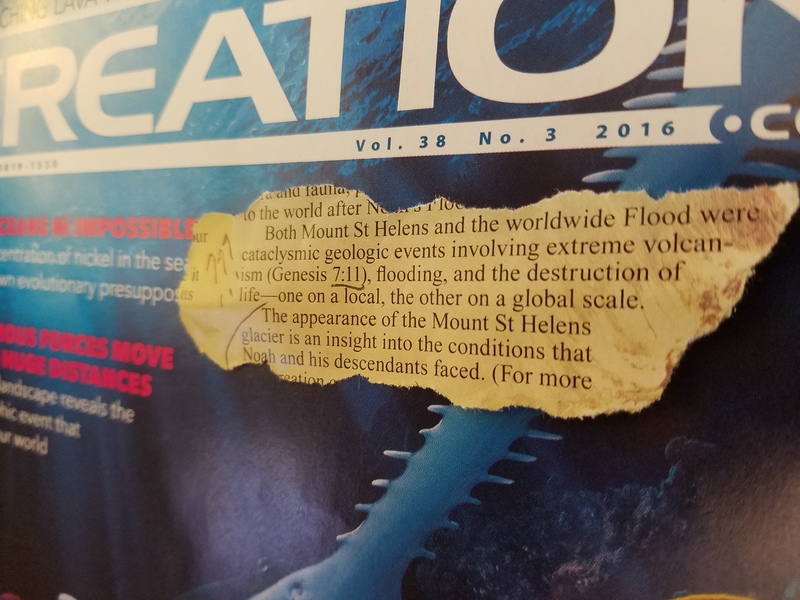 Just as "theistic" evolution is based on secular evolution, and wrong (see rsr.org/te), so to "Catastrophic" plate tectonics is based on the secular theory, and wrong (see rsr.org/cpt). The guys talk through three problems for PT & CPT, and a fourth for CPT, and then urge the listener to check our Dr. Walt Brown's global flood model called the Hydroplate Theory. 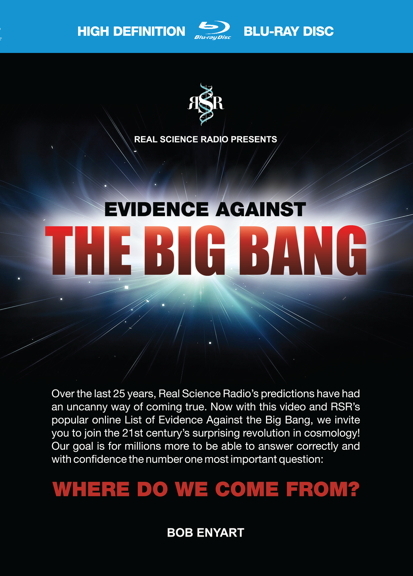 * Available as a Christmas Gift: The long-awaited astronomy video RSR's Evidence Against the Big Bang, is finally here! If you enjoy Real Science Radio and would like to help keep the guys broadcasting and reaching more people, you just might love getting your own copy of this really fun and informative video. This big bang video is persuasive in the way that RSR is known for and so it will also make a fabulous Christmas present for creationists and non-creationists alike! This bulk pricing is available on our online store or by calling us at 1-800-8Enyart. * 30-Day Moneyback Guarantee: And as we've done for 25 years on the air, BEL has a 30-day money back guarantee. * If Money's Tight: If you can't afford our materials, just send a check for whatever you can afford, to Bob Enyart Live, PO Box 583, Arvada CO 80001, and we'll help cover the costs and get this video to you! Just make sure to give us your mailing address and indicate whether you would like the Blu-ray or DVD. Thanks! * Hear RSR's Related Programs: For a list, check out rsr.org/bryan-nickel and rsr.org/walt-brown. * "Crossover Depth" Falsifies CPT & AiG Animation: Below 220 miles, called the "crossover depth", melted rock greatly compresses and so would not rise but sink. So aside from the biblical error of claiming that the fountains of the great deep were not water but magma, a physics error is that CPT has the magma impossibly rising through 1,800 miles of mantle up to the crossover depth. 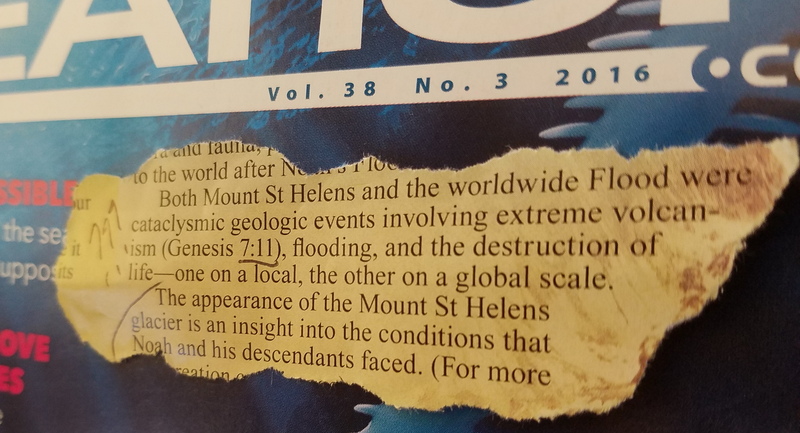 This and many other powerful scientific observations falsify catastrophic plate tectonics, AiG's animation, and also plate tectonics. (Just like the public hears very little about dinosaur soft tissue, because it exposes the falsity of old-earth paleontology, so too, the public hears little about the crossover depth, because it exposes the falsity of plate tectonics. See also rsr.org/flood and rsr.org/albright.) Consider further, the magma just beneath the mantle is approximately double the density of the mantle's solid rock that is sitting just inches above the liquid outer core. The main reason for the sharp boundary between the liquid outer core and the solid mantle is the difference in density. And again, by the laws of physics that magma cannot rise through the nearly 1600 miles from the core up to the crossover depth, as claimed by Answers in Genesis, Plate Tectonics, and the Catastrophic Plate Tectonics theory. Geologists are not physicists; they've developed many stories that somewhat match their worldview and that somewhat match the data, but the harder part is getting those stories to fit in with the laws of physics, which they do not. Further, if magma melted a path from the core up to the crust, its path could possibly be detectable today with seismic tomography. That now solidified path should have a sharp density contrast with the rest of the mantle. (Long, thin, straight lines are easy to detect. (Recall seeing from an airplane or satellite photos roads in jungles or bridges over rivers.) It seems that none of the theory authors of Catastrophic Plate Tectonics have ever predicted that such a path might be detectable. Contrast that with the many predictions made by Dr. Walt Brown, author of the Hydroplate Theory. See rsr.org/predictions for those, and for the many confirmations of stunning HPT-informed predictions. * On Thermodynamics and Rising Magma: Consider also, to melt a path upward through the entire mantle and crust, rising magma loses heat to its surroundings. The magma would solidify long before it reached the crust. In a private conversation with Dr. Brown, RSR learned that in the 1980s he did a brief study for a geology professor, Troy Pewe, who happened to be a member of the National Academy of Sciences (and a good friend of Walt's friend, one of the father's of plate tectonics and the one who coined the misnomer, "seafloor spreading", Bob Dietz). The question answered was, How large would a plume of magma have to be to melt its way to the surface of the earth (assuming it would rise). It turns out that such a plume would lose so much heat that it would have to be bigger than the Earth to melt its way all the way up to the surface! Though the results stunned him, Dr. Pewe did not dispute the calculations. And further, of course the speed of the rising magma would be an important variable, because the slower it rises the more heat is lost to surrounding rock. 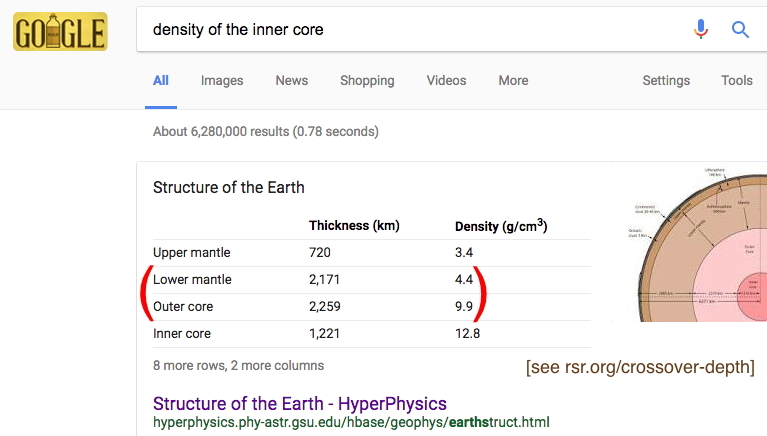 Question: If the speed at which magma would rise from the core is zero mph, how long would it take to reach the surface? Calculations are sometimes put forth in an attempt to show that plumes can rise through the mantle. Usually assumed are unrealistically low values for the mantle’s viscosity and density or unrealistically high values for the plume’s initial temperature and volume. These claims take the position, "We know flood basalts came from the outer core (where most magma resides), so here is how it must have happened." Others, looking at the physics involved and using the most reasonable numbers, admit they don’t understand how enormous volumes of flood basalts could rise through the mantle. My calculations show that a magma plume rising buoyantly and melting its way up from the core-mantle boundary would initially have to exceed the earth's volume for just one drop of magma to reach the earth’s surface. Others, cited below, have reached similar conclusions. - "A simple calculation shows that if ascent is governed by Stoke’s law, then the great viscosity of the lithosphere (about 1025 poise, if it is viscous at all) ensures that the ascent velocity will be about ten thousand times smaller than that necessary to prevent solidification. A successful ascent could be made only by unrealistically large bodies of magma." Bruce D. Marsh, "Island-Arc Volcanism," Earth’s History, Structure and Materials, editor Brian J. Skinner (Los Altos, California: William Kaufman, Inc., 1980), p. 108. - "The question of where the magma comes from and how it is generated are the most speculative in all of volcanology." Gordon A. Macdonald, Volcanoes (Englewood Cliffs, New Jersey: Prentice-Hall, Inc., 1972), p. 399. - "All the evidence that has been used so far to support the plume model—geochemical, petrological, thermal, topographic—is equivocal at best, if indeed not contrary. The plume idea is ad hoc, artificial, unnecessary, inadequate, and in some cases even self-defeating, and should be abandoned." H. C. Sheth, "Flood Basalts and Large Igneous Provinces from Deep Mantle Plumes: Fact, Fiction, and Fallacy," Tectonophysics, Vol. 311, 30 Sept. 1999, p. 23. - "There are no chemical or isotopic data that require deep- plume origins or anomalously high temperatures, and no reliable seismic-tomography results have ever revealed a plume." Gillian R. Foulger and Warren B. Hamilton, “Plume Hypothesis Challenged,” Nature, Vol. 505, 30 Jan. 2014, p. 618. - "Deep narrow thermal plumes are unnecessary and are precluded by uplift and subsidence data. The locations and volumes of ‘midplate’ volcanism appear to be controlled by lithospheric architecture, stress and cracks." Don L. Anderson, "The Thermal State of the Upper Mantle; No Role for Mantle Plumes," Geophysical Research Letters, Vol. 27, 15 Nov. 2000, p. 3623. Above the crossover depth of 220 miles, magma actually does rise, but it does so primarily through faults, not plumes. Magma rises along faults a million times faster because rising as a plume presents, "severe thermal and mechanical problems." Add to this observation another from our own rsr.org/atheism page, "the theory of plate tectonics begins with plates already in existence, and has no mechanism for the initial breaking of the crustal plates." While it may not be generally realized that the change in the volume of magma as it rises and sinks is the primary cause of shallow and deep earthquakes, geologists do agree that an earthquake is a sudden slippage along a preexisting fracture—a fault. Yet it takes much greater forces and energy to produce the preexisting fractures than to produce the slippage. So, what created the tens of thousands of fractures? Plate tectonics theory only tries to explain earthquakes that occur at plate boundaries, when plates rub against each other, but again, it never explains how those plate boundaries—fractures occurred. Further, most earthquakes occur inside or below plates and not at plate boundaries! The hydroplate theory of the global flood provides an explicit mechanism for breaking of the major plates and for the crushed crustal rock found globally. Gigantic shifts of mass during the flood produced a myriad of fractures through earth’s crust and mantle. These shifts included the 1,400-mile widening by erosion of the 46,000-mile-long, 60-mile-deep rupture, the deposition of eroded sediments, the uplift of the Atlantic floor and the corresponding subsidence on the opposite side of the earth, the formation of earth’s core, and the compression event. (See rsr.org/flood!) Of course, the many flood basalts around the world could not be produced without the preexisting faults for the lava to travel through and spill out of. Abutting the RSR studio to the east, the comparatively small Colorado Plateau has thousands of faults which geologists have mapped without knowing how they were formed nor how the plates initially broke apart. A biblically-based understanding of the global flood provides satisfying answers to these and hundreds of other significant questions.